Faith No More found their signature sound and commercial breakthrough with The Real Thing in 1989. This was the first release by the band to feature vocalist Mike Patton, who brought with him an experimental along with dynamic vocals. The rest of the group followed suit, expanding their sound to fuse such diverse genres as heavy metal, progressive rock, hip hop, funk, jazz, and soul. The end result made The Real Thing the group’s most successful album commercially and immensely influential to the emerging sound of the 1990s, with over half the albums tracks covered by later artists, and many fusion groups sprouting up over those years. 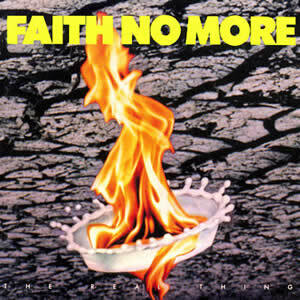 Faith No More was formed in 1981 by bassist Billy Gould and drummer Mike Bordin. They recorded two albums with vocalist Chuck Mosley, who joined the band in 1983. The debut We Care a Lot was released in 1985 with Introduce Yourself coming in 1987. The following year Mosley was fired due to “erratic behavior” which included falling asleep on stage during a live show. Patton was recruited soon after and took part in the majority of the lyric writing for The Real Thing in early 1989, although much of the music was composed while Mosley was still with the group. Beyond the eleven album tracks, the recording sessions in Sausalito, California also yielded extra songs, including “The Grade” and “The Cowboy Song” which later appeared on singles and later albums and “The Perfect Crime” which appeared on the soundtrack to the film Bill and Ted’s Bogus Journey. The album’s opener “From Out of Nowhere” is a straight up rocker with steady, driving rhythm and good and interesting chorus hook. Right from the start, Patton’s unique vocals stick out, making this song’s title a profound statement in of itself, and the thick instrumental arrangement is led by the coloring of keyboardist Roddy Bottum, who co-wrote the song. All five band members played a part in composing “Epic”, which would go to be Faith No More’s most popular song. From the hip-hop chant above the infectious bounce of Gould and Bordin’s rhythm during the rap-influenced verses, to the the rock drama of the chorus hooks, driven by guitarist James Martin. Although Martin really doesn’t perform any traditional leads, his great measured guitar riff during the elongated outro is a real highlight as it dissolves into the slow and distant classical-influenced piano coda by Bottum. “Falling to Pieces” begins with Gould and Bordin’s bass and drum intro with some swirling synths this time. This too gives way to the heavy funk of the verse. This song also became a minor hit, reaching #28 on the Mainstream Rock charts. “Surprise! You’re Dead!” dates back to the 1970s, written by Martin when he was with a group called Agents of Misfortune. This short, speed metal screed is vicious and strong with an indelible message, but not all that focused in composition. “Zombie Eaters” goes the other direction, with the classically picked acoustic guitar by Martin during opening verses setting the soft and spooky moods. This song eventually morphs into something much heavier in the way a loud car starts its engine and takes off, but has little more of substance beyond that. The interesting percussive intro by Bordin persists through long and dramatic first three verses of “The Real Thing”. This title tune later breaks into something more standard in heavy rock, but the multiple voices by Patton give it a rich kaleidoscope of moods throughout its eight minute duration. “Underwater Love” returns to a more standard, upbeat, radio-friendly rock, an oasis of this in the dramatic later part of the album. Gould provides more funky bass through the song proper, with a nice pattern to work in the dissolving outro. “The Morning After” is an overlooked gem with choppy bass and drum rhythms throughout with Martin working a counter guitar, first as a picked motif then later as driving heavy metal. Still, song never fully dives into the head-basing realm, just dabbles with it while staying melodic and interesting. The most interesting piece on the album is the instrumental “Woodpecker from Mars”, which nearly rivals some of the great classic prog rock instrumentals. It starts with dramatic choppy piano and surreal synth until Martin’s heavy guitars and Gould’s buzzy bass bring the piece to a whole other dynamic level. The second section is slow and droning but just as powerful as Martin masterfully employs feedback. This alternates back and forth with each iteration becoming more intense overall, a wild psychedelic ride which really helps elevate this album to the next level – acts as perfect into to the Balck sabbath cover “War Pigs”. Patton’s vocals work well with this, while the crisp rock of the group gives it a real edge without ever abandoning the vibe of the original Sabbath song. The album ends with “Edge of the World”, a jazzy and calm piece led by Bottum’s nightclub-inspired piano. The song’s chorus almost brings it up to a full rock arrangement while lyrically this song seems to focus on an old pervert and the object of his affection. A distant saxophone joins the arrangement as the song and album fades away. Although released in mid-1989, The Real Thing didn’t really peak on the charts until late 1990. On their next album, Angel Dust, Faith No More displayed an even more experimental effort, but did not last long beyond that as the group disbanded by the mid 1990s.